Lock in a great price for Holiday Inn Hotel & Suites St.Catharines-Niagara – rated 8.1 by recent guests! I liked the location, it was family friendly with the bowling alley and arcade just next door. Nothing special for sightseeing or visitors in the location, but it was a high quality stay overall. It has food available, and cafe in house. Would be good for business or family trips. Room was big enough for solo traveler. Very close to a bunch of restaurants. That was huge bonus for me since I stayed at the hotel to just rest not to move around too much. The air-con wasn't too loud. The door had a bunch of locks and I felt safe. Also the cleaning staff respected the do not disturb sign which was very appreciated. Location is quite close to a lot of things and easy access to highways. I don't know if all rooms have this feature, but our room (standard king) had two shower heads- one on either side of the shower. I have never seen this before but it was very pleasant. Other than that, the room was very clean and had a large (empty) mini fridge for guests to use, a microwave, and a working coffee maker. Definitely great value for the money! Internet connections was very good. The bed was very comfortable. Everyone was polite. The bowling alley is AWESOME. They staff cleaned the room well. Easy access off Highway, well designed suites for limited space. QUIET!! Rooms are beautiful. Hotel is fairly close to downtown St. Catharines. Newly renovated bowling alley is incredible. Rooftop bar is also a nice option in the summer. Holiday Inn Hotel & Suites St.Catharines-Niagara This rating is a reflection of how the property compares to the industry standard when it comes to price, facilities and services available. It's based on a self-evaluation by the property. Use this rating to help choose your stay! 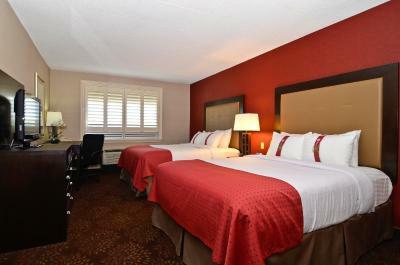 Each room provides a flat-screen TV with cable channels. A microwave and refrigerator are included. The bathroom is stocked with complimentary toiletries and a hairdryer. Holiday Inn Hotel & Suites St.Catharines-Niagara is 20 minutes' drive from Niagara Falls and 2.7 mi from Port Dalhousie. Short Hills Provincial Park is 5.9 mi away. 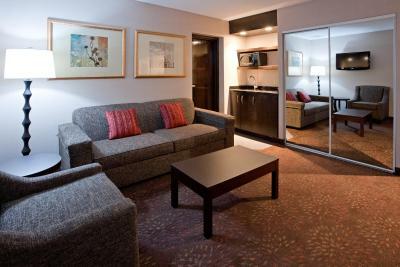 When would you like to stay at Holiday Inn Hotel & Suites St.Catharines-Niagara? Bed type are subject to availability and cannot be guaranteed. Spacious room with free Wi-Fi, large work desk with ergonomic chair, 32" flat-screen TV with Pay-Per-View movies and shower with hydro-massage facilities. This suite features a seating area with sofa bed. This room features a 32-inch flat-screen TV as well as a microwave and refrigerator. This suite features a 32-inch flat-screen TV as well as a microwave and refrigerator. Free high-speed internet and a 32-inch TV with in-room movies are provided. A fridge, microwave, coffee maker and work desk are available in this accessible room. Free Wi-Fi, two 32-inch TVs and a separate lounge with sofa bed are provided. A fridge and microwave are included. House Rules Holiday Inn Hotel & Suites St.Catharines-Niagara takes special requests – add in the next step! Holiday Inn Hotel &amp; Suites St.Catharines-Niagara accepts these cards and reserves the right to temporarily hold an amount prior to arrival. Holiday Inn Hotel & Suites St.Catharines-Niagara accepts these cards and reserves the right to temporarily hold an amount prior to arrival. I was disappointed by only one thing. I put in a request for my room that was not fulfilled, despite receiving a confirmation email stating that it could be done. No problems with the room otherwise. Ice Machines on all floors would be more convenient. Hotel empty and room assigned on the busy street side with all neons and lights . Very unconfortable . Early departure (5:30) has not coffee available nor apples. Breakfast starts only at 7am anyway !!!! Bed was not comfortable at all. 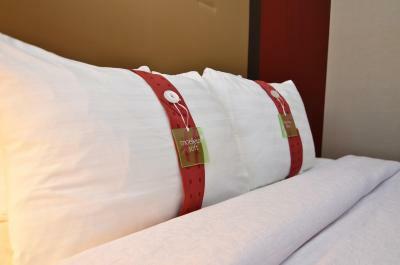 Great space, comfortable beds with choice of pillow!